Our classes are held at Kingsessing Library, at 1201 S. 51st St. (Get directions here!) We are always interested in adding both students and tutors to the program. Please tell anyone who may be interested! Adults with reading difficulties can have a hard time getting a drivers’ license. They can be perfectly competent drivers, but not be able to study the manual in order to pass the test. The test is given by ear, so it does not require reading. 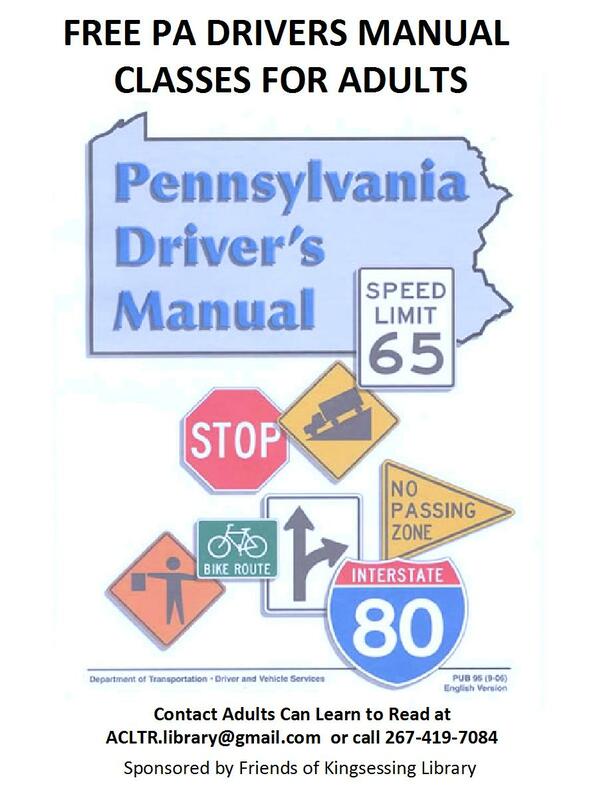 We are offering classes where the manual will be read to the students, as well as the practice questions, so they can learn the information and be able to get their licenses. Having a driver’s license increases independence, job opportunities and quality of life, as well as decreasing the likelihood of legal difficulties associated with driving without a license. We have a sister project teaching ESL students at Paschalville Library, 70th St. and Woodland Ave. (Get directions here!) They also are always looking for students and teachers. We can connect you with them if you’re interested. There is also the future possibility of starting ESL classes at Kingsessing, if students contact us needing them. We would love to expand the program into other parts of the city. Please contact us if you would like classes to be offered elsewhere.